That's what I had for dessert tonight. And that's actually what they call it. 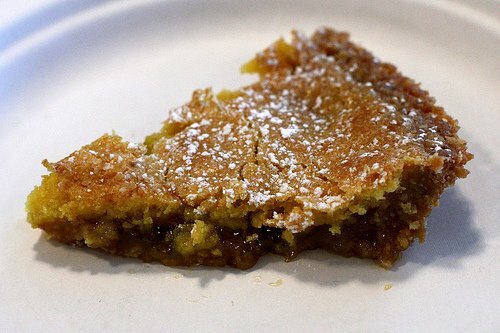 Crack pie - at Momofuku Milk Bar. Amazing. And Momofuku is the real deal. Not overhyped one bit. Carol and I hung out with her cousins tonight and shared a bunch of desserts there. One of the other delectables we had was something called the compost cookie. I wasn't the one who ordered it. It sounded nasty. Bits of pretzels, potato chips, butterscotch, and chocolate chips. Like a mix and mingle in your pantry gone horribly wrong. But man, it was actually good. Momofuku gets extra points for originality and for making a guy like me - sweet toothless - actually devour sweets. On a side note, what's the deal with people saying "it's like crack" when they want to express that something's really good? I'm willing to bet that the majority of those who use that phrase have never even touched crack with their fingers. And if a crack addict heard someone say that, I don't think they would tell the waitress, "I'll have what she's having." so true my friend. so true. :) the banana cake was uber good too!